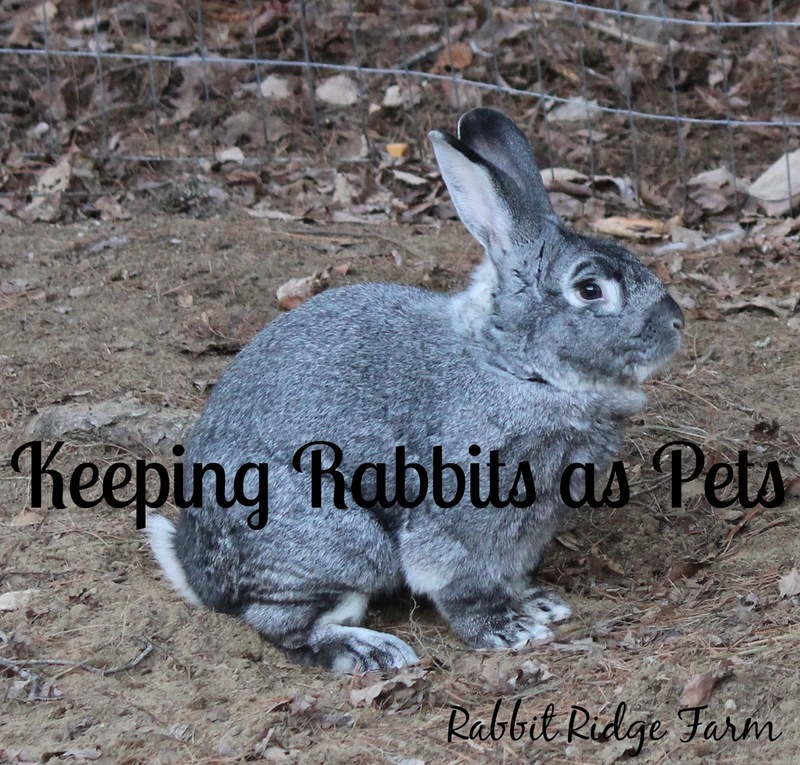 We have four pet rabbits and a lot of people have told me they find it a little strange. Even though I have done previous posts about our lovely little rabbit friends I feel like a more full post may answer some questions. While traditionally thought of as a meat animal on many homesteads rabbits also make awesome pets. When they’re not kept in tiny backyard hutches you can really see all their individual personalities. They can be just as loving as dogs and cats if you put in the time and effort. Pet rabbits also help produce rich garden compost and can produce fiber if you adopt an angora which require more care. Check out our post on making rabbit manure tea for your garden. Contrary to popular belief rabbits do not make good “starter pets” for children. Rabbits don’t make a lot of noise and their body language can be hard to read so children won’t necessarily see when the rabbit is uncomfortable like they would with a dog. This also makes it more difficult to truly bond with a rabbit and earn their trust. Rabbits are also much more delicate and prone to injuries than some other pet choices. Rabbits also require plenty of exercise and companionship to be happy and healthy. 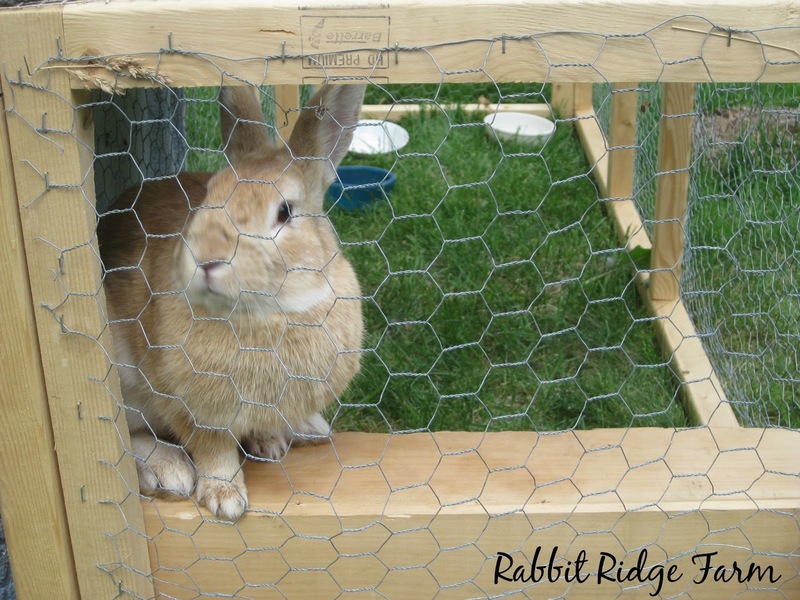 With this need for exercise time also comes the need for rabbit proofing. Many rabbits are especially fond of chewing through cords. Many people say that rabbits are fine living outdoors. the average lifespan of an outdoor, hutch rabbit it 5-7 years while that of an indoor rabbit is 10-13 years. If it’s truly healthy for them it probably wouldn’t cut their lifespan in half. The rabbits we have are indoor/outdoor rabbits. They are all rescue rabbits. 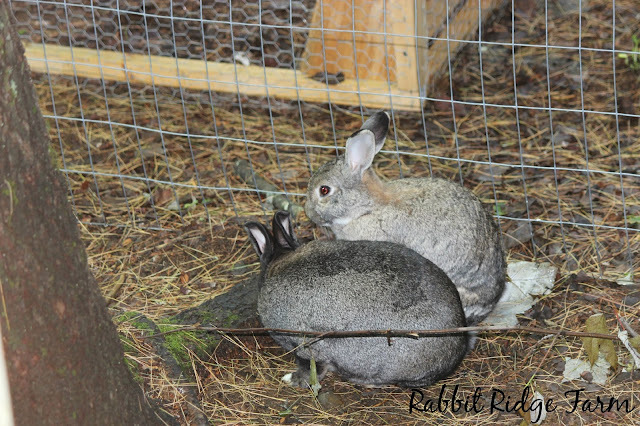 Learn more about how Buns made it to Rabbit Ridge Farm here. You can find his story here. You find out more about Mouse here and more about Vonsey here. The majority of our rabbits diet is hay. On average rabbits should eat a clump of hay their own body size each day. It is good to free feed hay though so you don’t really have to measure it. We also feed each of our rabbits some grain. They get different amounts depending on their weight and body size. I’ve seen a lot a different recommendations but it’s really all about the individual. Some rabbits put on weight a lot easier than others. When in doubt check with a rabbit savvy veterinarian. We also provide them with some fresh greens each day. When the rabbits are indoors for the colder months they eat greens we have grown or purchased or fodder we grow for them. In the summer they graze outside and are supplemented with greens from our garden such as kale, swiss chard, and radish and beet tops. Our rabbits spend a lot of the time during the warmer months outside (this may be more time now that we’re in WV). They are in a fully enclosed run near the house and are only allowed out in the daytime. In this run they have places to get out of the sun and hide if they feel threatened. Inside the rabbits are loose when we are home and awake and then are fenced in a smaller area when we’re gone or sleeping. They are litter box trained so they’re not too messy. We do have to change the litter boxes about once a week and sweep up hay and fur. We also have to keep our home “rabbit proofed”, no leaving cords or other fun things to chew within reach. Both their indoor and outdoor areas have toys so the rabbits don’t get bored. Rabbits also enjoy socialization. 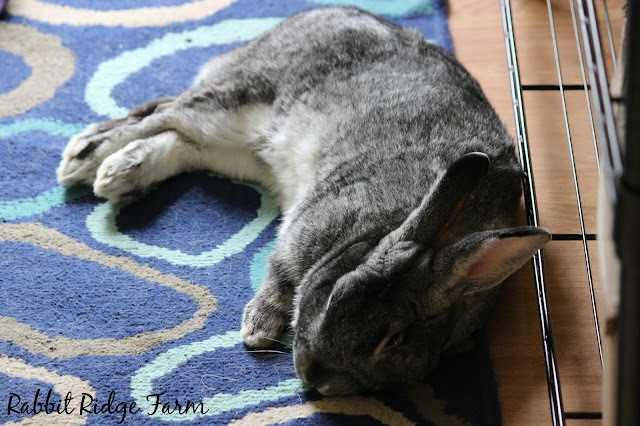 Rabbits do better with at least one bonded buddy but they also like spending time with their humans! Some love being held others just want to be petted. For more complete information on everything rabbit care check out the House Rabbit Network. They have tons of wonderful information.